The Kentucky Derby is America's most extravagant springtime sports party, and one of her most celebrated events. While there is a horse race at the heart of this spectacle, there are many other intriguing aspects within this Louisville tradition. It is a festival and fashion show, it's about Bourbon and Horses, Mint Juleps and Riverboats, and it's about time you see it! It's a chance of a lifetime, in a lifetime of chance, and it's high time you joined in the dance! This is the day we've been waiting for...our departure for The Kentucky Derby! Our overnight accommodations will be located in Grove City, OH. You are free to enjoy the Kickback Dinner at the hotel or dinner at your leisure. After breakfast at the hotel, we will depart for Cincinnati, Ohio where we will visit the Great American Ball Park, home of the Cincinnati Reds. We will also have time to explore the Hall of Fame & Museum. We will then continue our southwest journey to Louisville, Kentucky, the location of our lodging for the next three evenings. This evening we will enjoy a Bourbon, Barbecue and Country Music Dinner. There will be dancing and distillery tours plus a bourbon tasting opportunity. This is one of the most modern bourbon distilleries in Kentucky and we will be part of a festive evening planned as our kick-off event to the Derby. After breakfast at the hotel, we will enjoy a tour of the Louisville Slugger Museum. We will then tour Hermitage Farms, a world-class equine operation where champion thoroughbreds are born and nursed. These soon to be racehorses will just be learning to run. Lunch will be included at Claudia Sanders Dinner House, a replica of the elegant, old home opened by Colonel Sanders of KFC fame in 1959. A tour of Undulata Farms is also included in our touring today. Listed on the National Register of Historic Places, this Saddlebred Horse Farm is a private residence and horse training facility. We will have a chance to visit the Derby Hat Boutique where you can buy hats and accessories for both men & women. This afternoon we will return to our hotel for a chance to freshen up before tonight's "Off to the Races Dinner Party". The meal is a special "Taste of Kentucky" menu. Consider this a warm up to the big race tomorrow, a practice session, a chance to make a few bets, cheer for the favorite and share some laughs! Please note: The sequence of events in today's itinerary may not be as listed. Today's first event is the Derby Day Riverboat Race. Once underway there will be experts providing a few insider tips on the Derby Race. They will talk about the Horses, how they run in different conditions, who has the post and what that means, information on the trainers and their Derby History and more. You will also learn how to place a real bet at Churchill Downs. Next is the highlight of your trip, you have a VIP Fast Access Pass to Churchill Downs and 1st floor Grandstand Seats near the Starting Line. 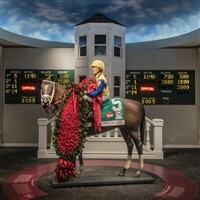 You will be at The Derby all day, enjoy crowd watching, sample a mint julep and place a few bets. This is one of the world's greatest and most celebrated sporting events, "The Fastest Two Minutes in Sports" and you are on hand to experience it all! After breakfast at the hotel, we will check-out and depart for Grove City, Ohio, the location of our overnight accommodations. You are free to enjoy the Kickback Dinner at the hotel or dinner at your leisure. This morning after breakfast we will check-out and depart for home. Arrival home is scheduled for early evening.